Make no mistake about it. Education is at a crossroads in the United States. Wherever you stand on Common Core, graduation rates, budget cuts, poverty’s impact on outcomes, teacher unions, coaches, public versus private, teacher evaluations, Gates and other corporate education influences and/or digital learning, you’ll find a slew of opponents to your opinion. What is clear, though, is that we have hundreds of thousands of individuals who have chosen to serve learners with their time, talents, and passion. I applaud you for waking up extra early, so you can fine-tune that lesson plan on the trajectories of hurricanes or grade the last batch of persuasive essays on whether O. Henry should be pardoned. I applaud you for spending your evening at Michael’s and using your extra time and sadly even your own money to ensure your first-grade turkey art projects bring joy to your students. I commend Algebra teachers who are compacting curriculum in nearly impossible ways because of furlough days and budget cuts. I applaud administrators working with new and old teachers alike to ensure they feel valued for their own creativity and impact. I applaud language arts teachers and librarians who help bring words to life and connect stories to emotion and humanity. Here’s to the social studies teachers and curriculum masters who challenge students to think about Columbus, Kent State, and the Boston Massacre in a new light and the physics instructors inspiring future engineers and problem solvers. To the educators and counselors who not only know students’ sometimes tragic back stories, but do what they can to let these students know they matter and provide support, I’d like to give you a standing ovation. Today, I salute professors who hold high expectations and hopes for their students. More and more of you are being paid far less than you should, yet we demand and command that you ready the next generation to lead and prosper. Here’s to you. To the tireless board members, district leaders, and education advocates who spend their days and/or evenings trying to make sense of it all, I tip my hat to you. Here’s to the staffs of education associations and foundations who work day in and out to fulfill vital missions. And to the PTO volunteers, janitors, cafeteria workers, bus drivers, music teachers, and robotics and sports coaches, as well as after-school care and office workers who go of your way to make students feel seen and valued, I thank you. Wherever you are located and whatever role you’re playing, I hope the gifts and passion that you have been sharing so freely are reflected back to you in spades today – and in the years ahead. You deserve it big time. Global #gtchat Award for Most Devoted Participant: Jo Freitag, @jofrei, who gets up at 3/4:00 a.m. in Australia every week to participate in our noon (EST) chat! Global #gtchat Award for Gifted News Postings: Lisa Conrad, @ljconrad, who is the gifted education news maven. She never fails to post timely, relevant links from around the world! Global #gtchat Award for Passion: Krissy Venosdale, @KTVee, whose infectious energy blankets her blog posts & tweets. She’s a space-loving, White House-visiting tweep who puts students first! Global #gtchat Award for Vision: Texas Association for the Gifted and Talented, @TXGifted, who put Social Networking on the big stage at its Gifted 3.0 Conference and offered free Wi-Fi to all attendees. Global #gtchat Award for International Impact: Tim Dracup, @GiftedPhoenix, who provides us with in-depth profiles of global gifted education centers & policy information regularly. Global #gtchat Award for Levity in Life: Jen Torbeck Merrill, @laughingatchaos, whose authentic, brilliant, no-holds-barred look at life w/2E kids gives us hope. Global #gtchat Award for Technical Prowess: Brian Housand, @brianhousand, who has been leading the way for 21st Century Learning & Gifted Education! Global #gtchat Award for Best Blog: Ian Byrd, @ByrdseedGifted, whose humble, yet potent leadership has created a firestorm of support for gifted learners. Global #gtchat Award for Homeschooling Leadership: Corin Barsily Goodwin, @GiftedHF, who has given homeschooling parents inspiration & resources galore. Global #gtchat Award for Lifetime Inspiration & Impact: Carolyn K., @HoagiesGifted, who has paved the way for us all to collaborate. She’s the mother of connection! Her contributions for the past 13/14 years have provided the foundation for connectivity and hope. I admire her greatly! Choosing was particularly difficult in several categories; however, I hope to honor additional worthy individuals in the years ahead! Congratulations again to this year’s winners. Thank you also to our Global #gtchat Sponsors, including @GattonAcademy, @GiftedDevCenter, and @TXGifted, and all the participants who have helped make #gtchat what it is today. Whether you are new to #gtchat or have been around since the first chat in January 2010, you matter! Here’s to a powerful and impactful 2012! As we come to the close of this year, I find it particularly refreshing to look back and reflect on the many blessings, which have been bestowed on this community of impassioned educators, parents, and gifted education advocates. Here are just five of the happenings, which have brought me hope and renewed my belief in our ability to positively alter the future for gifted learners via digital media collaboration, the removal of walls, creative programming, and strategic communications and advocacy. 1. Global #gtchat continues to grow. Our worldwide chat is now officially two years old! Congratulations to all of you who have helped make #gtchat what it is today. I continue to be overwhelmed by the devotion of participants who have made – or are just starting to make – #gtchat a regular part of their week and learning. Please join us for our last chat of 2011 this Friday, December 23rd at noon (EST), as we reflect as a community on “Progress Made in 2011; Hopes for 2012!” Global #gtchat will then take a holiday hiatus and resume its regular schedule on Friday, January 6th at noon (EST) and 7:00 pm (EST). 2. People throughout the world are recognizing the power of collaboration & digital platforms to benefit education. This year, participants from Argentina, Australia, Canada, Denmark, England, Germany, Honduras, India, Ireland, Mexico, New Zealand, and all throughout the United States demonstrated the power inherent in sharing resources, dialogue, and ideation in real-time to benefit these learners and those who serve them. The Ingeniosus site drew a record 55,000+ unique visitors from 150 countries in 2011 alone for a total of 800,000+ hits to date. <=look what you’ve created! 3. I’ve had a dream come true. When I participated in a Keynote Panel, moderated by TAGT President Lynette Breedlove, on the power of Social Media at the Texas Association for the Gifted and Talented’s Gifted 3.0 Conference, I felt immensely privileged. Addressing 1,000+ educators and parents, I had a ball and was blown away by the amount of interest, enthusiasm, and dedication demonstrated by individuals hungry to tap new professional and personal development opportunities online. Hearing people I’ve never met scream down a hallway, “I just sent my first tweet!” with enthusiasm made my heart sing. 4. I’m honored to be working with three of the finest organizations devoted to gifted learners right now. For 2011-2012, Global #gtchat Sponsors include The Gatton Academy of Mathematics and Science in Kentucky and the Gifted Development Center, as well as our new Lead Global #gtchat Sponsor, the Texas Association for the Gifted & Talented (TAGT). I also want to tip my hat to the Summer Enrichment Program at the University of Northern Colorado for its support this past year; it was an honor to serve you! 5. I’ve offered Social Media Trainings/Consults to premier organizations in the United States this year. Being able to debunk myths about the role of Social Media today, evoke an honest understanding of its power and capabilities, cull organizational findings via customized online surveys, and offer strategic communication and organizational recommendations to institutions and businesses serving gifted learners has allowed me to combine my knowledge and professional marketing experience in such a pragmatic way. When I see light bulbs going off and when I challenge organizations to view themselves in today’s environment versus “business as usual” I am able to see linchpins in action, which is satisfying beyond measure. Moreover, the Ingeniosus Authors Program launched in 2011 and has already started to gain momentum! 1. Kicking Ingeniosus into full gear. Ingeniosus is just three years old and is finally figuring out what it wants to be when it grows up – a leading global consulting firm dedicated to fostering connections to benefit gifted learners worldwide. In 2012, I plan to raise the ante on advocacy and programming, and also look forward to expanding the Web site, conducting more Social Media Trainings/Consults, securing additional Global #gtchat Sponsors, and growing the Ingeniosus Authors Program. 2. Being a productive rabblerouser. I’m committed to continuing to ask hard questions and provoke thought, action, and change. Seeing that my CALL TO ACTION: Making Gifted Education Relevant Today and 10 Ways Social Media and the Web Are Moving Gifted Education Forward posts were among the top-read posts of 2011 has further ignited my commitment to stepping out. Even stumbling across this news from the Government of South Australia’s Department for Education and Child Development reminds me of the exponential power of our work. Casting fear aside, I want to be bold enough to foster new paths and enthusiasm for intelligent advocacy today, new forms of professional development (including digital swaps and real-time collaboration), and a blend of traditional PR and sage digital relations. 3. Speaking to 12,000+ individuals in 2012. Educators, parents, and gifted education advocates are hungry for connection and learning. In 2012, I have a goal of speaking to 12,000+ people throughout the world via a variety of paid speaking engagements (in-person and Skype). Every person, every voice counts. Every parent who feels inspired, every educator who begins to incorporate more 21st Century Learning with his or her gifted students, every advocate who sees an avenue amid the Perfect Storm of gifted education matters. Every professor of gifted education who sees digital media as an opportunity and takes a risk, every gifted organization that asks itself how it needs to evolve to better serve, every parent who interacts more with local school boards, embraces their intense child, and partners more effectively with schools matters! Contact me if you want to help ensure this happens! 4. Launching the Ingeniosus “Your Move” Awards Program. This may prove to be one of the most challenging, yet inspirational endeavors yet; however, I’m determined to find a way to birth the Ingeniosus “Your Move” Program into being and provoke young minds to tap digital tools for social good this year. I’m currently working to secure judges and sponsors for this program. Stay tuned for what I hope will be a powerful illustration of the potency of young minds utilizing today’s technology for good while supporting passion and learning with global connections. 5. Remembering always that each person is a part of the harmonious whole. My life and work has been transformed because of you – yes you. If you’re reading this, if you have started to delve into the world of digital collaboration, and/or if you’re an advocate – young or old, then you have given my life immense purpose and supported my passion. Here’s hoping in 2012, I serve you — and those in your care — with fortitude as I do my part to honor the harmonious whole. What a conference! For those of you who had the privilege of attending the Texas Association for the Gifted & Talented Professional Development Conference, Gifted 3.0, I am hoping your time in Austin proved fruitful and inspiring. I certainly feel energized from the buzz created by the impassioned educators, administrators, psychologists, and parents who took part in this forward-thinking conference orchestrated by linchpin leaders, like TAGT’s Past President Michelle Swain, newly installed President Lynette Breedlove, Executive Director JJ Colburn, Associate Director Tracy Weinberg, Marketing & Communications Coordinator David Estlund, the Board of Directors, staff, and volunteers! Whether or not you attended this year, you will want to mark your calendars now for TAGT’s 35th Annual Professional Development Conference in Dallas, scheduled for November 28-30, 2012! It’s sure to be THE conference for visionary learning designed to serve and positively impact GT educators, administrators, parents, advocates, policy makers, psychologists, and students. For those of you who are becoming cognizant of the rich Professional Development (PD) opportunities inherent in Social Networking year round, I encourage you to “dip that digital toe” (thank you Dr. Lynette Breedlove) into the water and begin exploring Twitter to create your own Personal Learning Network (PLN). If you didn’t attend a session on how to get connected, here is a written How to Tweet Primer, which will help get you started, so you can begin engaging with educators from across the world and even learn how to participate in #gtchat, the weekly chat on Twitter devoted solely to issues of giftedness. Joel McIntosh, publisher of Prufrock Press, graciously put together a brief Guide to Twitter video prior to the conference. Wherever you live, it is worth checking out too. I encourage you to continue utilizing the #gtchat hashtag when you are posting resources, questions, and/or thoughts about gifted education in the days, weeks, and months ahead. Additionally, I suggest using TweetChat to search for the LIVE #gtchat stream throughout the week and on Fridays, rather than simply searching for #gtchat in the Twitter Search Box. You can also try HootSuite and/or TweetDeck. See what you like best and determine what feels the most comfortable to you! The LIVE Twitter feed in the Social Connections area right before #gtchat! Remember, #gtchat takes place at noon (EST) and 7pm (EST) every Friday, which is 11am (CST) and 6pm (CST). Feel free to lurk and/or participate. Here’s a picture of the swanky Social Connections area at this year’s #TAGT2011, which was made possible by Adventures in Learning. It was packed during the LIVE #gtchat session! If you have questions (big or small) in the days ahead, feel free to send me an email at deborah@ingeniosus.net. I will do my best to answer your question/s and/or find someone who might be able to assist. I do get hundreds of requests, so please be patient. There’s nothing I enjoy more, though, than helping gifted education advocates connect! TAGT, the 2010-2011 Lead Global #gtchat Sponsor, and other sponsors, including The Gatton Academy of Mathematics and Science in Kentucky, the Gifted Development Center in Denver, and the University of Northern Colorado’s Summer Enrichment Program, truly make #gtchat possible. Their support allows me to serve as a connector year round; I cannot thank them enough! For those of you who signed up to get updates following the conference, I will be sending out the next #gtchat NEWS in the next few weeks. This next issue will include links to gifted education blogs from around the world, links to suggested resources, and more! If you didn’t sign one of my sheets at the conference, feel free to subscribe to #gtchat NEWS by clicking here and looking for the “Subscribe to #gtchat NEWS” section on the lower, right-hand side of the page. If you have reflections on the conference, favorite 21st Century Learning tools you may have discovered, and/or new inspiration from #TAGT2011, I encourage you to “Leave a Reply” below and/or post to Twitter using #gtchat and #TAGT2011. The learning from this year’s powerful conference can continue, as we all work to serve this critical population with zeal! Lastly, I want to say again how honored I feel to be among such talented and creative individuals, who care so deeply about the needs of gifted learners. I was touched by the hospitality of Texans and also appreciate those of you from around the world who went out of their way to make new tweeps feel welcome on #gtchat. You’re helping to change the world for gifted learners one tweet at a time! Are You a Visual-Spatial Learner? At the time, I had never heard of the term visual-spatial learner (VSL), nor did I understand the essential implications for supporting students who think in images at school and at home. In describing how society views these individuals, she says, “…right-hemispheric giftedness turns all of our preconceived notions of “smart” upside down. Visual spatial-learners usually don’t conform to the typical notions we have about bright people. We rarely think of them as gifted children. Yet, in adult life, it is visual-spatial reasoning that leads to true genius: scientific and technological breakthroughs, innovative forms of art, inventions, new perspectives in every field, and visionary leadership. Sounds like something we should know about, right? There appear to be two major ways of learning: auditory-sequential (more left-hemispheric) and visual-spatial (more right-hemispheric). Auditory-sequential learners are good listeners, learn well in a step-by-step process, tend to be rapid processors of information, and are generally able to express themselves verbally. They are often able to compartmentalize their reasoning from their emotions. In contrast, visual-spatial learners are excellent observers, comprehend holistically – may have a sudden “Aha!” understanding that leaps over steps – appear to think in images, may need translation time to put their ideas into words, and sometimes have word retrieval problems. Their thinking and emotions are very intertwined. So, why then should we learn more about visual-spatial learners? Neither learning style is better than the other. According to Silverman, “Some of my highly gifted, complex friends find this dichotomy too simplistic. Maybe it is. I certainly don’t mean to imply that people are completely one or the other. I see each pair of the characteristics as a continuum, and I believe we are all a mixture of both. Do you think in images? Are you a visual-spatial learner? Are you ready to discern whether your student is a VSL? Whether you’re a VSL? Click here for the Visual-Spatial/Auditory-Sequential Identifier. Then, to learn more, visit http://visualspatial.com/. This site, which will be redesigned soon, is chock full of useful information for teachers, parents, psychologists, and administrators. I also highly recommend the book, “Upside-Down Brilliance.” It’s now available for purchase via the Australian Gifted Support Centre. Click here for the order form (it’s a bit tricky to open; you’ll need to right-click and save). It’s worth it though. 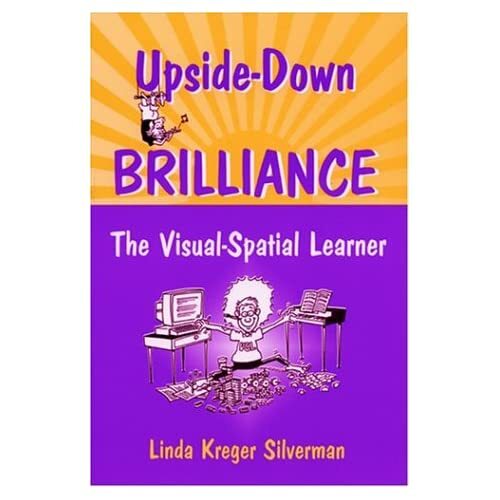 This book provides specifics on all things visual-spatial, including assessment, twice-exceptional students, the inner world of introverts, the challenges of parenting a visual-spatial learner, teaching techniques that work, and what it means to be a visual-spatial adult. I could not put it down. When I saw one of the cartoons in the book, with a teacher asking a student this question, “You mean to tell me that you can do this complex math problem, but you can’t tell me what day follows Tuesday?” I smiled and thought of my daughter. She makes more sense to me now. And isn’t that what the best books do? Expand our knowledge and understanding? Here’s to visual-spatial learners everywhere; after all, you do make the world click!